Hematopoiesis of bone cells and marrow stromal cells. In the bone marrow HSCs reside either next to osteoblasts on the endosteal niche or adjacent to endothelial cells of sinusoidal vessels. Upon each division, 1 daughter cell leaves the bone to proliferate and differentiate into various lineages. HSCs and their progeny are surrounded by stromal cells derived from MSCs, which also reside in the bone cavity. 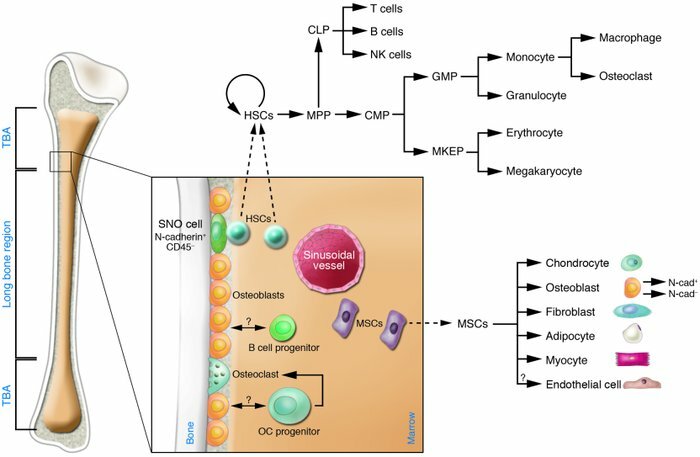 MSCs give rise to chondrocytes, osteoblasts, fibroblasts, adipocytes, endothelium, and myocytes. Osteoblasts (expressing M-CSF, RANKL, and OPG and producing IL-7) may regulate lymphoid (expressing IL-7R) and osteoclast (derived from monocytes, expressing the M-CSF ligand c-Fms and RANK) cell development. CMP, common myeloid progenitor; CLP, common lymphoid progenitor; GMP, granulocyte/macrophage progenitor; MKEP, megakaryocyte erythroid progenitor; MPP, multipotent progenitor stem cell; OC, osteoclast progenitor; SNO cell, spindle-shaped N-cadherin+CD45– osteoblastic cell; TBA, trabecular bone area.